The Adventurer was designed in collaboration with Rémi Camus, extreme adventurer. Rémi Camus is committed, by way of various initiatives, to raising public awareness on conservation and access to water. The Adventurer is compact in size and light in weight, 2 must-have qualities for adventures. It is both light and easy to handle while is being very strong. 2 "notched" areas on the top of the blade so that a club can be used with the blade for batoning without slipping. 4 holes on the handle to fit a lanyard covering the hand if necessary or to transform into a spear. 1 sharp scraping area on the top of the blade used as a firesteel. "Double" braided paracord handle for excellent grip. The Adventurer has a rigid ambidextrous POM (Polyoxymethylene) adjustable retention sheath. The knife is removed by pressing with the thumb on the top of the sheath. It can be attached directly to the leg holster 5.11, GK, Safariland and Black Hawk. This sheath comes with a flexible, reinforced tactiprene belt loop, with multiple holes for right or left wear on the belt. A kit allows for the sheath to be positioned on the MOLLE loops of a jacket in the vertical or horizontal position. Magnifique couteau acheté pour offrir. Personne plus que ravi . Comme à chaque commande : contacts commerciaux, délai de livraison et produits au top ! Bravo à cette entreprise ! 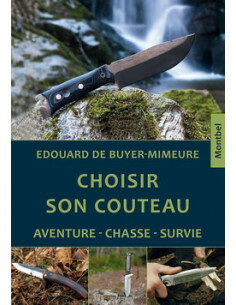 Couteau particulièrement bien affûté et adapté à mon utilisation sur le terrain. Il paraît très solide et devrait me satisfaire longtemps. Bravo Wildsteer. Il s'agit d'un cadeau à offrir ; donc je n'ai pas ouvert le paquet. Mais le poids, la taille de l'objet me semblent tout à fait appropriés à l'usage que la personne destinataire du cadeau (militaire) compte en faire.